In the past several years, online degree acquisition has expanded significantly in the United States. Though first exclusively offered by for-profit, online-only institutions, then community colleges, in recent years major non-profit colleges and universities have also expanded education into cyberspace. The for-profit University of Phoenix-Arizona now enrolls more than 320,000 online students, while the non-profit Liberty University and Miami Dade College enroll over 100,000 and 90,000 online students respectively. Even elite universities have begun to offer more online degrees. Columbia, Johns Hopkins, Northwestern and Stanford Universities, as well as the University of Chicago, offer complete online certificates and master’s degrees in many professional and post-graduate fields. Yale University conducts online undergraduate coursework over its summer term that the university considers comparably rigorous to the in-class experience. 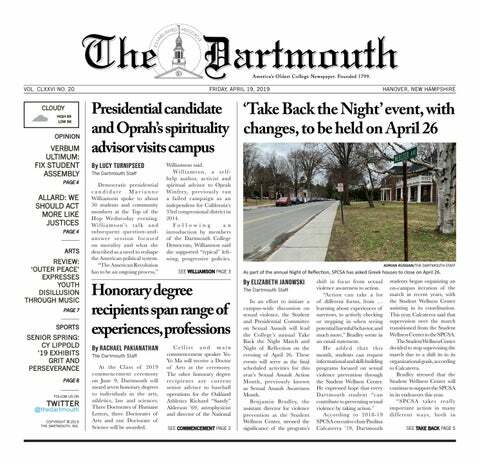 Dartmouth has also waded into the field of online degrees. In similar fashion to Harvard’s “blended degrees,” whereby students earn credit in both virtual and physical courses, the College provides “hybrid learning” programs through the Tuck School of Business and Institute for Health Policy and Clinical Practice. While established brick-and-mortar campuses have been more reticent to offer fully accredited undergraduate degrees online, that reality is also shifting. In September, the University of Pennsylvania announced it would begin offering bachelor’s degrees through its College of Liberal and Professional Studies. The rise of online degrees is understandable. Online degrees and coursework are especially popular in more professional and vocational fields of study, where concrete skills or knowledge are prized most from the collegiate experience. Online degrees are also much more widely available than brick-and-mortar classrooms, garnering a high rate of adoption among public community colleges and universities interested in increasing access to education. The College and many of its peers are far more insulated from the ramifications of the rising digital classroom than other institutions. The online classroom is disrupting higher education insofar as it makes access to basic facts and teaching ubiquitous. Institutions that do not offer much beyond rote learning will struggle in the new environment. Thankfully, Dartmouth does not count itself among this group. The College is fully cognizant that it offers more than just the facts students may retain from the classroom. It is likely unfeasible and possibly undesirable for Dartmouth to exchange qualities integral to its educational model pursuing goals best provided by other institutions. Where the College may engage in the digital space, like expanding the College’s massive open online course offerings, efforts should be amplified. Such opportunities for expansion, however, are not as ample or clear at the College as they are elsewhere. The digitization of American higher education is a rapidly increasing trend, one that will change how students learn and study, as well as what prospective applicants come to expect from their university experience. Dartmouth does not need to accommodate all of these shifting expectations, but it must develop cogent rejoinders to justify its model of education for those who will question the utility of the liberal arts model in an age of virtual degrees. The abundance of resources, events and opportunities found on campus, the College’s touted teacher-scholar model and the opportunity to travel the world and experience a tight-knit community of future leaders at Dartmouth would all be lost if students never had to step foot in Hanover to obtain their degree. Dartmouth, and any school that can offer its students more than just a certificate of competency in a skill, shouldn’t sacrifice the intangible and important qualities that make their education opportunities so valuable. If established universities are to experiment or adopt fully online degrees and coursework, they must be honest about the value offered by that academic experience. Though in many cases, the education provided by an online degree is comparable to what one would learn in a physical setting, this would likely not be the case for any institution operating on the liberal arts model. It would be a shame to watch any respected university leverage its reputation to market an overpriced online degree separate from its true value. Though the landscape of American higher education is shifting again, recent educational advents likely won’t threaten Dartmouth’s fundamental commitments to the liberal arts. Virtual degrees are likely to become an important addition to the higher education landscape, but educators should remain conscious of the limits and benefits this new model provides. Dartmouth will likewise need to further question the value of the education it offers. Resting on one’s laurels in an era of unlimited knowledge is to be anything but informed.